Today I’m thinking about the difference between a positive and a negative attitude, and how these attitudes can be a true measure of our faith. Yesterday’s scripture reading included Numbers 13 where Moses sent several men to spy out the land of Canaan. The spies went as instructed, but depending on their point of view, their reports and responses differed. First the favorable view and response that reflected faith in God. Caleb saw the goodness that God had been promising all along and was eager to continue toward that goodness in obedience. And then the bad report and response that demonstrated a lack of faith in God. Remember, God had been promising he would take them to this land, and that he would be with them; they just needed to trust him. Except here, they saw some adversity, ignored the goodness, ignored all that God had done thus far and chose to shrink in fear. This is blatant lack of trust in God’s very specific plan for them. Isn’t it interesting that the same group of people witnessed the same events, but yet their individual responses varied so greatly? Remember, these are the same people who were slaves in Egypt, but were rescued by God through Moses and had been wandering through the desert en route to the promised land. God had been taking care of them, feeding them, guiding them, day and night, but again some adversity and they chose to check out. When the congregation heard the bad report, they decided that it would have been better to go back to Egypt to become slaves, or better to have died in Egypt rather than be there in the desert. On the opposite side, those who put their trust in God responded in in an optimistic manner. Numbers 14 reflects how serious God is with regard to how he wants us to trust him in all things. Those who chose not to trust him were severely punished, and those who did trust him were greatly rewarded. We’re on a certain path, unsure as to what is ahead. There are hardships and unknowns, and even some bad reports. There is also evidence of God’s faithfulness and goodness; a call to trust him. In this pattern, we have free will and can choose to either listen to the bad reports, live in fear and give up, or we can be thankful for what we have and trust that God has always, and will always hold us in his hands. The pattern played out for me recently. Our son Peyton had outdoor education this week. It was a two night trip for his entire fifth grade class to East Bay Camp in Hudson, Illinois. Several weeks ago in preparation for the retreat, the school asked dads to volunteer to stay in the cabins with the boys overnight. My first instinct was, I’m all in; I love being a dad, and I want to be there for my son. Except I had heard a bad report about this volunteer mission and actually had people tell me not to go. It would probably be cold, rainy, and muddy. The kids would likely be all wound up or over-tired and misbehave, and would stay up too late. The accommodations would be miserable, dirty, and uncomfortable. I’d actually heard this from more than one person, so what was I to think? Fortunately I trusted my God-given instincts and decided that no matter how bad the report was, the right thing to do was to volunteer – and it was amazing! I cannot imagine having missed out on this event. When Peyton looked me in the eyes and thanked me for being there, it made it all worthwhile and nearly brought me to tears. 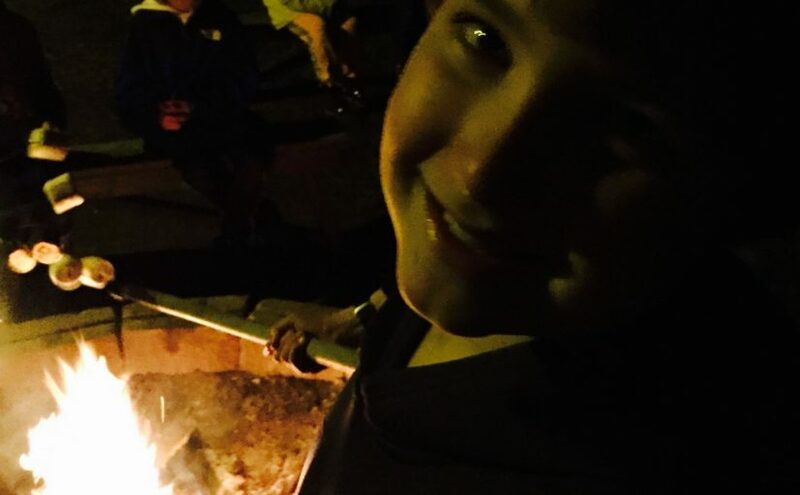 I got to observe my son and his peers having so much fun, there was a beautiful campfire, a night hike through the woods, s’mores, and giggling little kids having a total blast. Priceless moments that can never ever be replicated in this lifetime with that little boy. What if I missed that because of a bad report? Now I am actually in tears. We need to be careful with how we share our observations. If we see something potentially negative, how much should we share this information? Consider the source of the bad report. Did this person witness/experience the negative thing first hand? Even with a substantiated bad report, what are the opportunities that may be hidden within? We were created by an Almighty God to live with purpose on this earth. My purpose is not laying around on the comfort of my couch, zoning out in front of the television to escape the realities of life. God created us so that we would please him and trust in him and his goodness, and from that we will be rewarded.